Saturday morning I was having a nightmare about the toilet when I wake up to the words no one wants to hear first thing in the morning, "Cecilia, I accidentally flushed my phone down the toilet." At first I thought it was a joke but when I rushed over to the toilet there Daryl was trying to see if it got stuck somewhere he could reach. Daryl then convinced me that the water was clean and I tried reaching but felt absolutely nothing. We then googled what other people have done and to have a plumber come get it would cost at least $85-100 per hour. We figured we could get the job done ourselves. 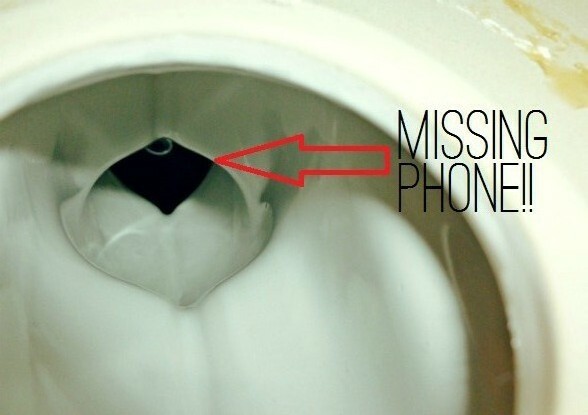 Our worst fear was that the phone was stuck somewhere in our toilets pipes and that toilet paper would eventually clog the thing so we just wanted to either make sure it made it down the city waste pipe or somehow grab it from our toilet. 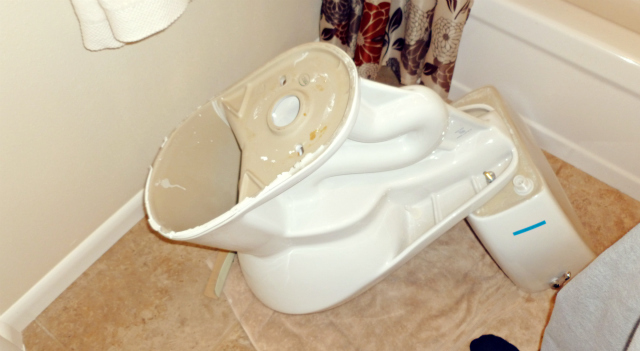 We mainly used this site and common sense to get the toilet apart because most sites didn't apply to our situation. We drained most of the water out of the toilet and Daryl tipped it over I was excited to see his phone inside now the only problem was getting it out. 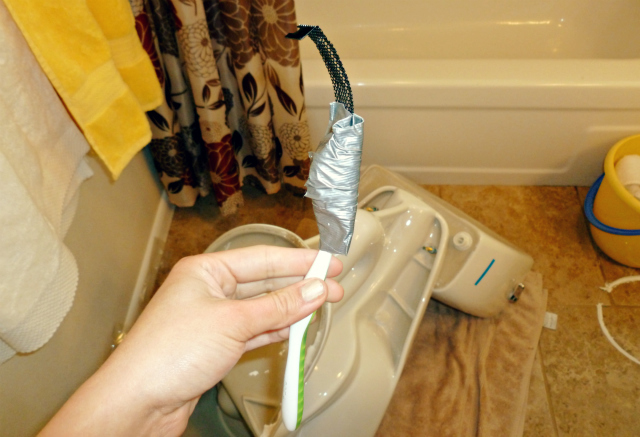 We used pliers and a blade to get the toilet disconnected. A big bucket, a small bucket (in this case an old can of almonds), and lots of little towels to drain the water from the toilet bowl. We were originally using soap to soap up my small hand and the little black part of Daryl's computer to try and push it up but my hand wasn't small enough. I then had the bright idea of putting this little thing together all you need is duck tape, an old tooth brush, and something bendable (in this case an old part previously used in one of Daryl's computers). I eventually pushed it through and Daryl decided to turn the toilet so that it could work its way back into the bowl and wa-la! We were SO EXCITED when it was all said and done! All we need to buy in order to fix the toilet was Kwik Seal ($2.98) and a Wax Ring ($3.49). All together with tax the $6.91! We saved ourselves at least $78.09!! His phone is currently sitting on our window seal drying, I'll keep you guys posted on whether it works or not when we try turning it on next week. Well that's how we spent our Saturday afternoon. Anyone else have any epic adventures? haha awe i'm so glad you blogged this! you sweet (and mcguyver-like) newlyweds will one day enjoy showing this to your kids. i know i would have loved to read something like this (with pictures!) about my parents. i just can't believe he flushed his phone. So you know those pics we took in the car the other day? They are on my camera (turns out I didn't have my sim card in there when we took them) do you know how I can transfer them from the camera to the card? no what you've got to do is use your usb. the photos are recorded to your limited built-in camera memory. do you have your usb still? argh, whenever I put my phone in my back pocket and go to the bathroom I get SO paranoid that it'll fall into the toilet and I will flush without even noticing it. This is hilarious though (I mean, I bet at the time it wasn't) - it definitely comes in handy living with a man ;) Glad you saved yourselves a ton of money! Oh my gosh this is my worst fear! I feel like that is going to happen to me one day! Aghh, so glad you documented the whole thing. Made for a great post! Hahah oh my gosh this made me laugh so hard! No he leaned over to flush the toilet (after peeing) and it was in his hoodie pocket and as the toilet was flushing -PLOP- the phone goes! Bahahaha, oh my goodness, Cecilia! This is freaking awesome. oh my!! salute your great effort guys! Blog hopping from MamaMazone....you should put the phone in rice. It helps to dry it out and in some cases the phone will work. Wow. I hope it works! How did he FLUSH it down the toilet? He didn't realize it had fallen in? You both are amazing for getting it at all on your own! HAHA well he leaned over to flush the toilet (after peeing) and it was in his hoodie pocket and as the toilet was flushing -PLOP- and up the pipes the phone went!